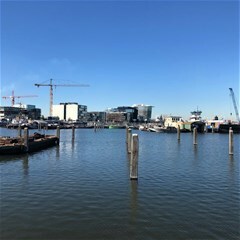 Memeleiland 174 Amsterdam - Peter Bruin Makelaardij o.g. b.v. The apartment is situated on the 1st floor of a nicely designed building with elevator. It is fully furnished and comes with an open kitchen fitted with various appliances including an induction hob, dishwasher, oven and a refrigerator with freezer. From the balcony you have a nice view at the canal. The apartment is installed with laminated flooring that has underfloor heating (and cooling in summer). The solar panels will reduce your energy costs even more, making the apartment very energy efficient. The apartment is equipped with a demotic system for lightening and Sonos-system. The master bedroom has a double box spring bed and a large fitted wardrobe. For the other bedroom you can make your choice for a single bedroom, child's room or study. The bathroom has a walk-in shower, toilet and two sinks. Separate toilet. Internal storage space with washing and dryer as well as storage shelves. 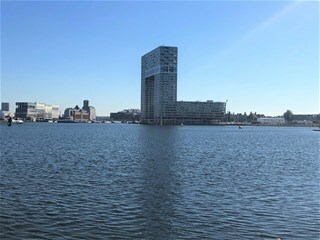 The apartment is located at the Houthavens, a newly constructed area that will develop in the coming years into a full-scale urban expansion with facilities, water and greenery. The end of the Spaarndammerstraat, with almost all conveniences, cafes and restaurants, is in walking distance. Popular neighbourhoods like the Jordaan and Westerpark can be reached by bike in just a few minutes. Public transport is well organized, bus 22 and 48 from Central Station has a stop nearby. Within 10 minutes of cycling you will be in downtown Amsterdam. To reach the main motor way (A10) will take only 5 minutes by car.